Conventional multi-leaf springs often require somewhere from eight to 11 leaves within the pack to carry the desired weight demanded by many 4WD owners. Parabolic Springs will do the same job with only two leaves. Parabolic springs have leaves with a tapered profile. This tapering is based on the parabola that for every mm that the leaf thickness decreases this amount relates to the square function of the leaf. This is the technical way to say that each parabolic leaf has the same shape & function of a complete multi-leaf spring – thick at the center and thinner at the outer ends. This means that a single parabolic leaf is able to cope with the same forces inside the leaf as a complete conventional 8 multi-leaf or more spring. 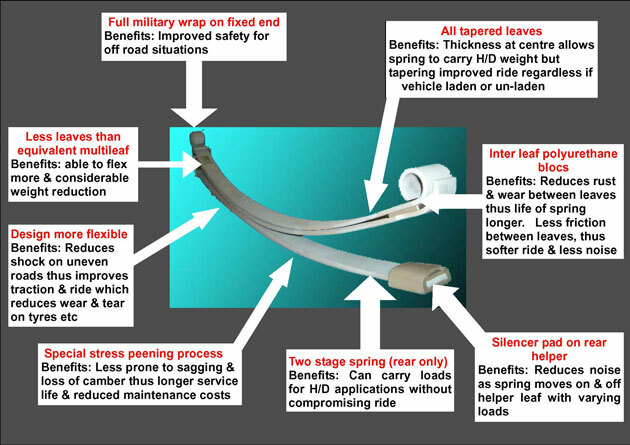 The ideal parabolic spring only requires one single leaf but for safety reasons our Australian designed 4WD parabolic springs have a minimum of two leaves. The second leaf is a wrap style leaf acting as a safeguard in the unlikely event of a breakage. Westralia Springs’ parabolic springs have been designed to be 100% compatible with standard suspension fittings however it is recommended to upgrade the shock absorbers to high quality, far reaching, heavy duty for maximum performance. We recommend Raw4x4 Nitromax. Hilux GUN (Coil/Leaf 2015 on) – coming late 2019!! Ford Ranger / BT50 – coming late 2019 !! If your 4wd model is not listed above then we do not have parabolic springs in stock for your model.